LOS ANGELES - Manny's going to cut the hair. "I got to cut it, guys," Manny Ramírez said yesterday at his introductory press conference behind home plate at Dodger Stadium. "I'm going to look like a baby now . . . They got some rules here. I don't want them to treat me different than the other guys." Funny, that's not how it worked in Boston. Manny always wanted special treatment. In the end, he wanted a ticket out of town and the Red Sox accommodated him one final time when they unloaded him in a three-team deal in the final minutes of Thursday's trading deadline. So now Manny is a Dodger and he's wearing No. 99. He started in left field last night, batting cleanup against legendary Arizona lefthander Randy Johnson. He finished 2 for 4 and grounded into a double play in the ninth inning as the Diamondbacks prevailed, 2-1. When Joe Torre, Manny's new manager, was asked about the goofy outfielder's famous dreadlocks, the skipper said: "I just asked how important it was to him. I asked him what he wanted to do. He'll clean it up a little bit. He wants to be treated like everybody else." Hmmmm. Tell that to Terry Francona. Tell it to Tito's doctor. Tell it to his former Boston teammates, who saw Manny quit in his final days with Boston. Everything was all better in Mannyworld when Ramírez popped out of the Dodger dugout just after 4 p.m. (Pacific time). He engaged in a 10-minute group interview, some of which was conducted in Spanish. The Los Angeles press was extremely friendly and Manny addressed several reporters as "sir." There was a smattering of applause at the end of the session. You can tell it's going to be just swell here for Manny. The only time things got remotely edgy, almost Boston-like, was when a reporter said Theo Epstein had revealed that some of Manny's veteran Boston teammates wanted him traded. "I'm not going to waste energy when people talk like that," Manny answered. "I want people to judge me on what I do here, not what I did in Boston . . . Whatever happened in Boston is in the past. When people ask about Boston, I put my brain on pause." He lobbed a bouquet at the legion of Sox fans who worshiped him for 7 1/2 seasons. "From the bottom of my heart, I want to thank the fans of Boston," he said. "I love you guys. You've been with me through ups and downs." Manny flew out of Logan Airport on American Airlines Flight 725, departing at 11:05 a.m. He sat in a window seat in the first row of first class and was accompanied by Justin Taglianetti (a member of agent Scott Boras's agency) and longtime friend Angel Pena. "People were great to him at Logan," said Taglianetti. "They were hugging him, bidding him farewell." Boras picked up the mini-Manny entourage at LAX just after 2 p.m. and Manny checked into a local hotel. They got to Dodger Stadium at 3:38 p.m. and Boras went down by the dugout and commenced defending Manny's honor. "I don't think any of his managers, coaches, or teammates said he wasn't running out balls," said the super agent. "His style was the same and they had a lot of success with him. "In Boston, the fans, the organization, and the teammates were never an issue. He preferred another city along the lines of the lifestyle he had in Cleveland . . . He enjoyed being in another experience other than the intensity of Boston." Manny was embraced by his new teammates, including old friends Nomar Garciaparra and Derek Lowe. Both ex-Sox were happy to advance the theory that the Boston organization likes to run stars out of town. In a bit of irony, the Dodgers put Garciaparra (strained medial collateral ligament in his left knee) on the disabled list to make room for Manny. In yesterday's Los Angeles Times, Nomar told Bill Shaikin, "Manny said he didn't want to leave [Boston]. I didn't want to leave there . . . We're not the only ones that have gone through it. There's a track record. I played with Mo [Vaughn]. I played with Roger [Clemens]." Right, Nomie. You played in Boston and you hated it. You turned down a four-year, $60 million offer from the Sox before you got yourself shipped out of town in 2004. Lowe said, "It just seemed like toward the end, if there was a chance a guy wasn't coming back, you started hearing more negative stuff about the guy. You'd hear rumbling about certain people and it seemed like those were the ones who didn't come back." Manny wasn't having any of the negative stuff. "I'm just thinking Blue now," he said. "I'm kind of nervous . . . 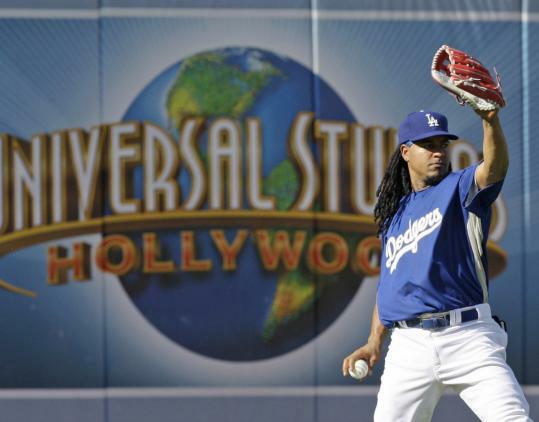 When I was a little boy in the Dominican Republic, my first baseball uniform was one from the Dodgers. No. 30. So the No. 30 has always been my favorite." He couldn't have No. 24 because the Dodgers retired the digit in honor of late manager Walter Alston. Manny said he wouldn't take 34 "because that's Fernando's [Valenzuela's] number and he's the king." For reasons unknown, Manny settled on No. 99, made famous in Los Angeles by Wayne Gretzky. "It's a new chapter in my life," he said. "Just come and play and move on. I'm happy to be here. LA is a great city . . . In Boston and now in Los Angeles, I've always had the support of the Latinos. I feel at home here. "I accomplished a lot out there [in Boston]. Two World Series and I did a great job, thanks to God. And, well, that's in the past." In the end, Boston proved too much for the man. There'll be none of that nasty "intensity" here in La-La Land. Maybe they'll let Manny leave in the seventh inning with the rest of the fans. Los Angeles. It's a good fit for old No. 99.